Kyle Busch trashes the trophy after Nationwide race at Nashville Superspeedway earlier in the season. Nashville – If Kyle Busch’s plan was to mend some fences with a return visit to Nashville after June’s embarrassing guitar-smashing tirade, he failed miserably. Busch, coming off Saturday night’s Sprint Cup victory at Bristol, ran a Champion Racing Association (CRA) race at Nashville’s Fairgrounds Speedway and sparks started flying well before the race began. Busch told a track PR person it was “stupid” to incorporate his pre-race press conference with that of Chase Elliott, 14-year-old son of NASCAR star Bill Elliott, and 16-year-old female driver Johanna Long who started on the pole. 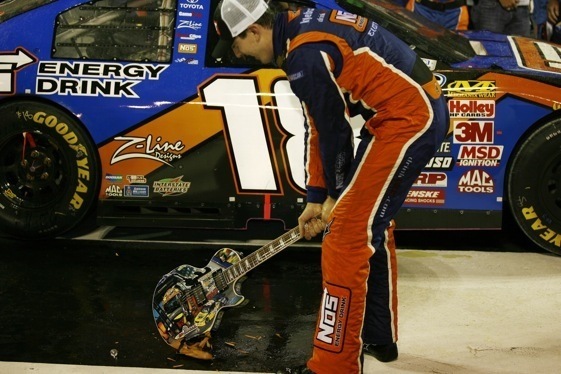 When the press conference began, Busch was asked if he regretted smashing the classic Gibson guitar after winning a Nationwide Series race at Nashville Superspeedway – a different Nashville-area track – back in June. A person in Busch’s entourage heatedly confronted a reporter whom he called him a “(bleeping) idiot” for asking Busch about the guitar-smashing incident. That same unidentified person made a slashing sign across his throat, apparently signaling Busch to end the exchange with reporters, which was become more and more heated. One veteran Nashville TV sports reporter said the press conference was the most tension-filled he had ever witnessed. Busch started 21st the in 32-car field and was caught up in a seven-car crash on lap six. He went out for keeps 20 laps from the end of the 150-lap race, won by Indiana driver Scott Hantz. Long, who ran with the leaders throughout the race, finished 5th and young Elliott came in 8th , also with a solid run. Busch, booed during driver introductions (while also receiving a smattering of cheers), after the race presented a trophy guitar to Hantz. According to a press release, his foundation donated some guitars to a children’s charity. Busch shows up at a Nashville press conference and doesn’t want to be asked about breaking the trophy guitar the last time he was there? What did he expect to be asked about, the weather? I am not a Kyle fan by any means, but this smells of typical media **** stirring, there must be some guidelines placed on press gatherings or they will always turn into drama, lets face it thats what sells. Lets stick to the guidelines, give those other young drivers thier 5 minutes of fame and wait for Kyle to self destruct on National TV on another day. You can count on that happening. So, that PC version of kyle we heard at Bristol after his ‘media training’ session didn’t last too long. What a surprise. I was actually lucky enough to be in that press conference and I believe the first thing mentioned when Kyle walked into the media center was not to discuss the guitar incident and to stay focused on the race and the fairgrounds. The first question asked was about the guitar incident and I heard his response, it was very tactful and well thought out. He was comical when asked about his car and even complimented Chase and Johanna. Did you notice Mike Curb, from Curb Records, was on hand also to support Kyle? It’s too bad that all the good that Kyle is doing in the Nashville area is overshadowed because you seem to not want to talk about the good that he does. It’s appearent that the only thing that’s still sour in Nashville is your opinion, maybe stale is a better word. Also, if all you were called is an idiot for asking the same question twice that you were specifically asked not to ask, you should be thankful. ANd you wonder why professional athletes don’t enjoy talking to the media, sometimes you guys just completely miss it. Thanks Kyle for coming to Nashville and for supporting the youth in the community, we hope to have you back soon.